Geißenklösterle Cave (Allemagne): birthplace of European music and art ? Perforated teeth and ornaments from the Aurignacian site of Geißenklösterle. The remains of the world's oldest musical instruments and human figurines suggest that music and artistic depictions of the human form may have first developed in Germany around 40,000 years ago, say researchers. This is two to three millennia earlier than previously thought. Scientists need an accurate timeline of events in Europe to understand the development of human culture. They get this by carbon-dating objects from archaeological sites. But before this study, there were large variations in the carbon dates from Europe's many stone-age sites. Now, analysis at the Oxford Radiocarbon Accelerator Unit has used new techniques to remove contamination from the samples, producing more accurate results. The team's findings suggest that the Swabian Jura of southwest Germany was a key site in the development of modern human culture in Europe. "We started using improved techniques back in 2001, and we noticed something very interesting," explains Professor Tom Higham from the University of Oxford, lead author of a paper published in the Journal of Human Evolution. "When we re-dated objects, the results tended to be a lot older than we previously thought, and this is because we removed contaminants more successfully." "So we applied the same methods to sites with evidence for the earliest modern humans, sites where the ages you measure are critically important. We found that the dates are much more consistent – the new dating work has made sense of the sites." Most scholars think that the transition from a Neanderthal-dominated Europe to one populated by modern humans happened 35,000 to 45,000 years ago. Scientists call this the Aurignacian period, when modern humans become widespread all over Europe. Archaeologists have found evidence for more developed artistic expression around this time, rather than just decorative patterns. What scientists don't know is how this spread of people and ideas happened. The findings in Germany help provide an answer. While modern humans were developing art, music and mythology in the Swabia, parts of central and Western Europe were still populated by Neanderthals. The researchers think that the early humans moved into the Swabian Jura along the Danube corridor, before moving into Italy and France later, which explains why the Swabian artifacts are a little bit older than those from other areas. "The Danube corridor idea was first proposed around ten years ago. It suggests that people moved along this river corridor at an early date. It's a good idea because people need to be near sources of water,' Higham says. 'There are several early sites along the Danube River which support this idea." The artifacts found in the German sites include the oldest representation of the human body that has ever been discovered. Professor Nicholas Conard from the University of Tubingen, who was also involved in the new analysis, found the Venus of Hohle Fels in 2008. It was sculpted out of a wooly mammoth tusk. 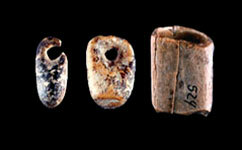 Also found in the mountain caves were fragments of the oldest bone flutes yet unearthed. These instruments were and painstakingly put together over three years. "The flutes have been reconstructed and played and the music has been recorded. They sound like flutes - they really can be played. The people who made these artifacts were not just anatomically but behaviorally similar to us." Both the flutes and the Venus were once parts of a living creature; this means they can be carbon-dated. Carbon dating involves measuring the amount of the heavy form of carbon, carbon-14, present in tiny samples from the artefacts. Carbon-14 is taken up during the lives of plants, and passed to animals that eat them, but once the plant is dead, that carbon breaks down and isn't replaced. Therefore older bones have less carbon-14, letting us determine their age.